I’ve been wanting to try different collodion formulas for quite some time now but never gotten around to it. Having seen a collodion image made with a solution containing 3 salts and seemingly resulting in a wider scale of tonality I figured the time had come to get some tests done with different formulas. I talked about it with Jeroen, a friend, and he also mentioned a formula containing 4 salts. I was able to borrow some of his salts as buying them required getting a large quantity and resulting in an empty wallet 😉 Today I’ve mixed my first batch of a formula I wanted to try. It’s called: Lea’s Landscape #7 Alternate Formula, leaving out the additional ether and using 4 salts. I’ll post the recipe below and a photo of how it looks freshly mixed. I’ll have to let it sit for a couple of days though before being able to use it. Still waiting for other chemicals to arrive to make the other formulas so no problem! First, dissolve the cadmium bromide in the alcohol. Then, dissolve the ammonium bromide into that solution followed by the other two salts. 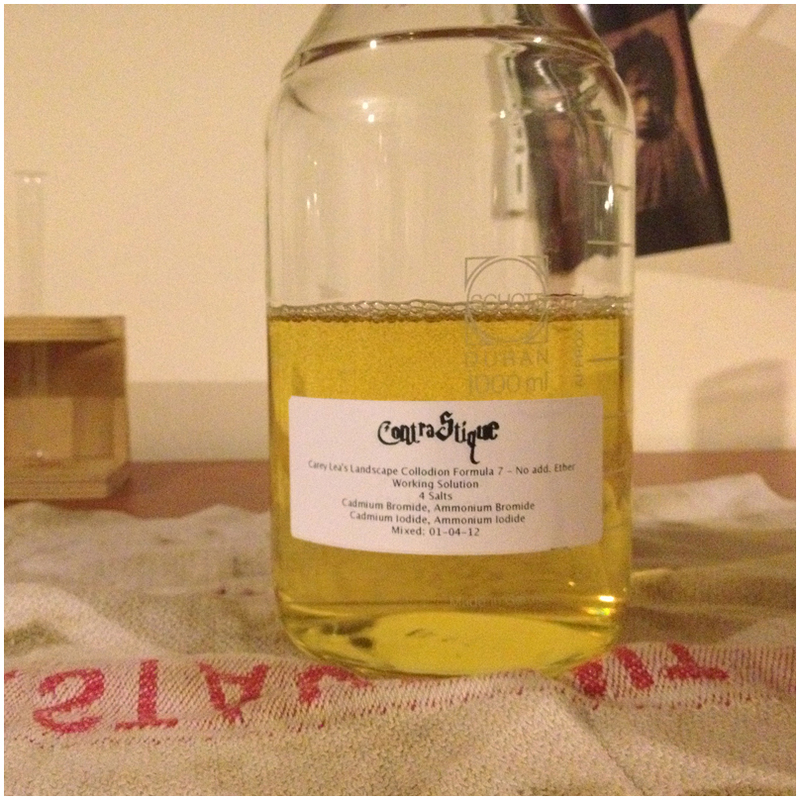 The working collodion should be fully ripened and ready to use within 2-3 days. I’ll post a photo of the solution in a couple of days to see the change in color and luminosity. Hopefully I’ll receive my other chemicals somewhere this week so I can make the other batches. The ones you can expect are Lea’s Traditional Landscape Formula #7 (with additional ether), John Coffer’s Old Workhorse (fast clear) and Ostermans Formula (no cadmium) . More on the exact formulas later! As you probably noticed both Lea’s formulas contain two cadmium salts and according to the guiding literature this results in longer storage life and a slightly greater sensitivity than some other formulas but the collodion tends to be more fragile and has the tendency to lift from the plate surface. Subbing the edges with a cotton swab saturated with albumen helps adhere this collodion film to the plate. Note to self: Make albumen! Filter through a cheesecloth and ready to use! N.B. For the ones having read the first formula of albumen I put here…that was the formula for making albumen prints so different than the one used for edging. Sorry for the mix up! This entry was posted on April 1, 2012 by Contrastique. It was filed under Wet Plate Collodion-Process & Chemistry and was tagged with 4 salt collodion, albumen, Ammonium Bromide, Ammonium Iodide, Cadmium Bromide, Cadmium Iodide, etherless, formula, salt, wet plate collodion. The albumen formula you have here is for making albumen printing paper. Is that what you want? If you want to sub your plate, use 1 egg white in 1 liter of water, and a splash of ammonia, mix well and its ready to go. You can float paper on your albumen, and after its dry, float it on a 20% solution of silver nitrate and print glass plate negatives. I mixed stuff up. I couldn’t remember the formula for edging so looked up albumen in the Book of Photographic Processes. But indeed I looked at the formula for making albumen prints and that’s not what I meant. Already corrected! Thanks for sharing! Hi! Tell me please why don’t you use ether? Hi, Simply because I wanted to use a formula without ether to see if it is differently in handling etc. I normally always use a recipe with additional ether.